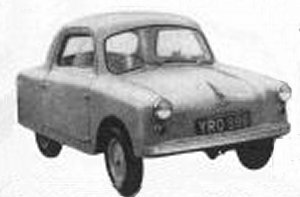 The Unicar was manufactured in 1956 by S.E. Opperman of Boreham Wood, UK. Designed by Laurie Bond the vehicle was powered with a 225cc Excelsior engine or a 328cc British Anzani engine that was mounted to the rear of the vehicle. A sports version was also introduced in 1958 that was powered by a Styr-Puch 500 engine and gave the fibreglass bodied vehicle a top speed of 75mph. Production ceased in 1958. In addition to the Unicar the company also manufactured the Opperman Motocart that was a large 3-wheeled agricultural vehicle. Power came from a 600cc JAP petrol engine that was mounted to the side of the front wheel.